"The sumptuous In lieblicher Bläue (2015) for violin and orchestra is the standout piece here, given a reading by its dedicatee Carolin Widmann that is so supple, considered and committed that it’s hard to believe it’s a live capture of the work’s very first performance (reviewed in the June 2015 issue)." Widmann’s reading of Alban Berg’s last completed work, his Violin Concerto, sounded deeply emotional – almost romantic. Her playing was powerful when needed (for example, in much of the Allegro’s pseudo-cadenza), but also, quietly serene in the appropriate places: for several minutes at the beginning of the first movement, she refrained from vibrating any note, producing a transparently pure sound quality, as she allowed the famous open strings motif and its transformations to soar and decline. These colours may well have been on the composer’s mind when he wrote on the title page: “in memory of an angel”. 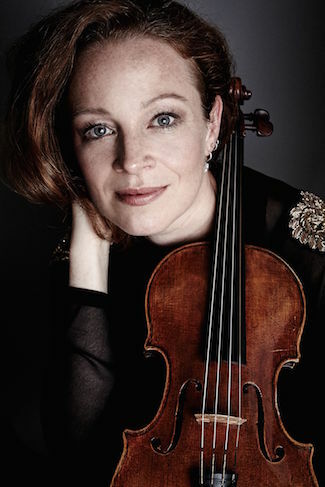 The program also marked the Australian debut of German violinist Carolin Widmann, who has performed the Berg concerto with Dohnanyi and the Philharmonia. She proved the perfect soloist in this exquisite work by perhaps the most approachable of the serialist composers of the Second Viennese School. Widmann demonstrated superb composure, accuracy and taste in this performance and hopefully she will return so Sydney audiences can hear more of her. And so Carolin Widmann and the Philharmonia’s performance was a revelation. Expressive, warm, rich, terrifying, menacing, explosive, even moments of humour; this was a full-blooded exploration of the gamut of human emotion. Dohnányi pulled out textures and opened up the work, showing and communicating a deep understanding of its complexity as well as its expressiveness. Widmann devoured the music with total ardour, switching between warm, rich, dark, lyrical and folky tones with ease. The entry of the chorale melody midway through the second movement felt completely organic, as did its transition to the original Bach realisation on the woodwinds. The melting of the soloist into the main body of the first violins towards the end was particularly lovely too.